When it comes to holiday decorations I am not nearly as disciplined as I am with buying groceries. I like to pick up a new thing or two for the various holidays, even if its just at the dollar store. But this year, I resisted the impulse to buy any more fall holiday decorations, and just reused all of the decor that I've bought in previous years. I mixed it up a bit to make it look fresh for this year, putting decor pieces in different places. In the early years of making a home this is how I kept our space looking fresh, by moving things around. For me, for right now, this is not as much about not spending money, but more about not accumulating more stuff. So, my rule for fall decorating is "don't unnecessarily add to the accumulation of stuff." The non-spoken part of that rule is that I "can" buy consumable items to use as holiday decor, such as pretty squashes. Besides, I think that natural items, such as squash and pumpkins, make some of the loveliest of fall decorations. They just have an upside, and that is that you get to eat them as fall turns over into winter. Here's my kitchen door. Nothing fancy, but it makes coming and going through the kitchen (which, let's face it, our kitchen door is used by family and guests more than our front door) so pleasant. The faux leaf garland was from Dollar Tree the year before last, and used to wrap around the front "Welcome" sign. The bow at the top, also from DollarTree, graced an outdoor light fixture the past two years. The faux pumpkin is a must for outdoor pumpkins in our neighborhood (squirrels like to nibble on pumpkins left outside), and is from three years ago. And the window clings I already mentioned (you can't see them in the big photo, but they're on the upper portion of the glass inset). It's homey, did not cost me a penny this year, and won't add to the stuff in storage after fall is over. P.S. I am so proud of myself for not buying more stuff. I have a bit of a "stuff addiction." It's great to see a new post from you! I am trying to do the same thing with decorations - using what I have, just trying to be creative with new combinations, placement, etc. Thank you. I'm glad to be able to post again. I find that I can get the same kind of "charge" out of reusing what I have, but in a new and creative way that I get buying something ew. For me, at least, the newness is what gives me that boost. I don't do a lot of decorating, but now I'm thinking about the garage door, the one that we enter the house through. The whole area is pretty scuzzy including the door. This is one area in the new house we haven't gotten to. However, maybe I could clean things up a bit around it and decorate for fall. That should put a smile on our faces as we come in and out. Thanks for the inspiration. I can imagine that fixing a new-to-you house to your liking takes a considerable amount of time and effort. And it does seem like the back entrance is the last spot most folks tackle, likely because it's seen by family, only. But I do like fixing up things that only our family will notice (or even, only I will notice). It's good to do nice things for ourselves. And if it doesn't cost much (or anything, as the case may be), that's a bonus! I love your kitchen door! I haven't really done any decorating for fall. I told hubby I need him to pull down the boxes for me today! Thank you! It;s not a lot and only took a small amount of time to do. 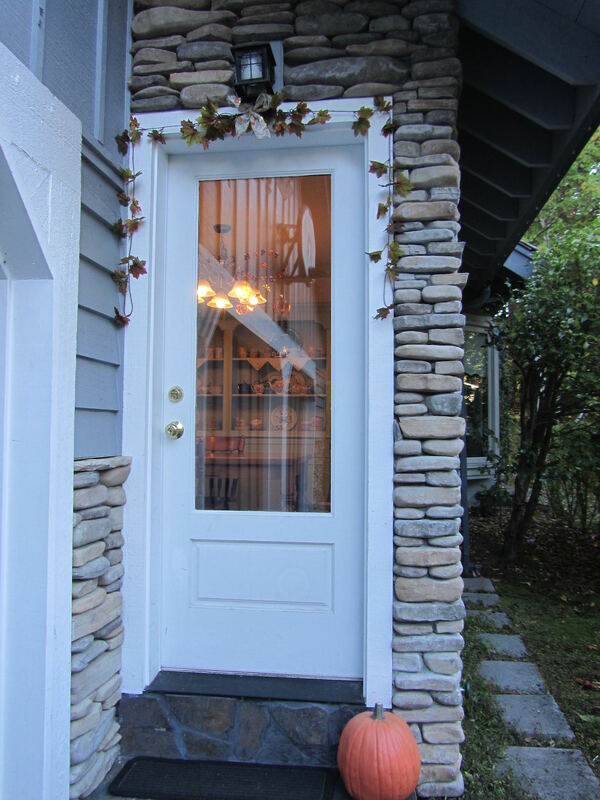 The most labor intensive part was putting a couple of nails in the trim around the door to grab onto the leaf garland. Oh, it sounds like maybe you'll have a fun project for the weekend! Have a good time with it! So good to hear from you Lili. Like Alice said in an earlier post, I too was worried a bit about you. Glad you're back on whatever posting schedule works for you! I also tend to want to buy seasonal decor items and am much more disciplined re: purchasing food. There is this beautiful "boutique-y" store here that is always decorated beautifully. I have picked up some lovely items there over the years, on clearance (which makes them more affordable). I do go there for inspiration and did so last weekend, but this time not to purchase anything, but to see if there were any new ideas. I'm at the stage where I DO NOT NEED any more stuff! So I went and previewed their shop and left empty handed as planned, but with some ideas of new ways to reuse what I already have. The only problem here in NC is that it still feels like summer!! High today is 84. And though it's hot, I've got a pot of soup on. We may have to cut the a/c down to eat it, but I'm ready for fall! It's been a long hot summer, with no end in sight yet. Good to see comments from virtual friends! Hope you, Lili, and others are having a good start to the new season. You weren't in the path of the storm were you? I hope that you and your family were not impacted in any serious way. Good job, on going to the boutique store just for ideas. We have a couple of shops that are like that near us. I try very hard not to buy, and just get ideas. I'm sure your home will look lovely for your guests. The dried hydrangeas sound beautiful. They can keep for several years, which is a bonus for the years that I just don't get around to cutting any to dry. I understand the desire for actual fall weather, now that the calendar says "fall." I'll trade you for a few days. We are cold and rainy today! Hope you have a wonderful weekend, Lynn! Lili, thank you for your concern. Because Hurricane Florence took a turn, we had only minimal impact-wind and minor flooding. However, my family was where it came ashore. For the first time ever in their lives (lived there over 60 years), they evacuated. Their house was fine with only minimal damage, but the resultant flooding from all.that.rain kept them from returning home for over two weeks. All the roads in/out of their city were impassable. Recovery is continuing, but it is going to be a very long process. I shudder to think what would have happened had the storm remained a category 4 hurricane. Lynn, I am relieved to hear that the outcome was not horrible. I can imagine the time it takes for communities to recover. News of a storm leaves the national coverage soon after. Most of us remain unaware that folks are still struggling or towns are still repairing roads. I hope the rest of the season is uneventful.